As with saddle bronc riding and team roping, the roots of tie-down roping can be traced back to the working ranches of the Old West. When calves were sick or injured, cowboys had to rope and immobilize them quickly for veterinary treatment. The mounted cowboy starts from a box to the right of the chute holding the calf. The horse is trained to come to a stop as soon as the cowboy throws his loop and catches the calf. The cowboy then dismounts, sprints to the calf and throws it by hand, a maneuver called flanking. If the calf is not standing when the cowboy reaches it, he must allow the calf to get back on its feet before flanking it. 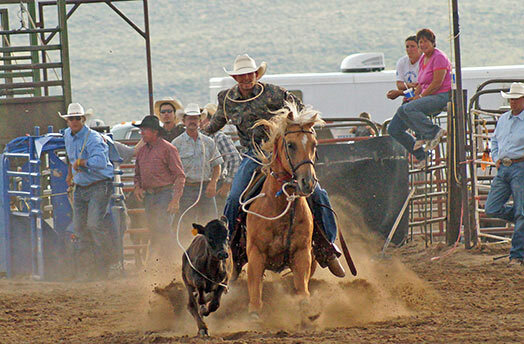 After the calf is flanked, the roper ties any three legs together with a pigging string - a short, looped rope he clenches in his teeth during the run. When the roper finishes tying the calf, he throws his hands in the air as a signal to the judge that the run is completed. The roper then remounts his horse, rides forward to create slack in the rope and waits six seconds to see if the calf remains tied. If the calf kicks free, the roper receives no time.